Oticon, founded in 1904 in Denmark, is one of the world’s oldest hearing aid manufacturers. From the early mission of serving “people first,” Oticon is committed to research and development that innovates hearing technology. In conjunction with Eriksholm Research Centre, whose primary role is “to make discoveries with the potential to significantly enhance end-user benefits in future hearing instruments,” Oticon has produced advanced technology to improve the lives of people with hearing loss. Oticon Opn S™ is a brand-new listening experience and a game-changing hearing aid. 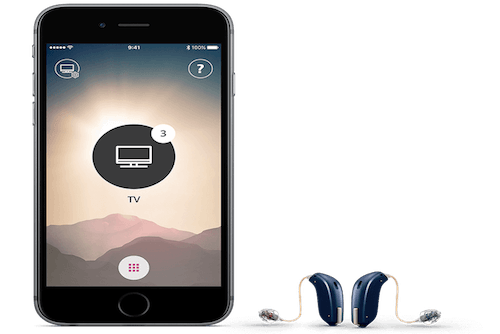 While traditional hearing aids provide wearers with a narrow cone of focus, Oticon Opn S™ provides an open sound solution, which opens up the spectrum of sound in your environment and empowers your brain to choose where to focus. The new Oticon Opn S™ helps people with hearing loss thrive in noisy venues, such as bars and restaurants. Say goodbye to feedback and hello to all of the lifestyle-enhancing connectivity features that Oticon is renowned for revolutionizing. With Velox, a super-fast processing platform, Opn provides you with access to sounds you want to hear while almost simultaneously removing extraneous background noise. This fast and open access to sound means you can switch your attention with faster speed and better precision than ever before. Velox scans your environment 100 times per second, providing you to accurate audio information around you, with 30% improved speech understanding. With the new open platform, 96% of Opn wearers say they “heard better – much better” and 92% of customers were satisfied or very satisfied. Even better, 50% of Opn wearers claim to participate in more social situations, with sounds in the environment more natural and balanced. One-third of Opn wearers are more confident while using the device. With wireless connectivity, Opn connects directly to your smartphones and allows you to stream sounds directly to your ears. Moreover, Opn is the world’s first hearing aid to connect directly to the Internet, giving you access to an archive of sounds. Additionally, Opn provides Oticon’s trustworthy Tinnitus SoundSupport, a system that allows you to take control of the ringing in your ears. Tinnitus SoundSupport offers relief with customizable sounds, including ocean waves or synthetic tones. The mini receiver-in-the-ear (RITE) T model provides wearers with a telecoil, which allows you to connect to hearing loop systems in public and private spaces, providing crystal clear sound from PA systems streamed directly to your ears. Oticon Siya is the world’s first hearing aid in the essential category with 2.4 GHz Bluetooth® low energy. This gives industry-leading wireless connectivity with high-quality streaming of sound and low battery consumption. Now you can easily connect wirelessly to smartphones, TVs and many other devices. Available at two lower technology levels and varying power levels – SIYA is a hearing aid designed to suit high expectations at a lower price point. For people with hearing loss, speech recognition poses a challenge. Speech Guard E improves speech recognition in various noise environments, such as busy restaurants or in cross conversation with multiple speakers. Our sense of hearing helps to situate us within the context of our surroundings, and with hearing loss, this may become difficult. The Spatial Sound feature simulates a binaural hearing experience to better situate the wearer within their surroundings. At the same time, FreeFocus allows the wearer to filter out sounds that are extraneous or a part of background noise, and to focus on the sounds they want to hear. Similarly, the YouMatic feature gives the wearer control, tailoring volume and features to provide a seamless and comfortable listening environment. Rooted in the science that hearing happens in the brain, Oticon’s BrainHearing technology supports this process with a new processing system and newly developed features. As sound waves are sent to the brain, Oticon’s Inium processing system enhances the parts of the signal that the individual ear does not hear well, which keeps neural pathways engaged. The brain hears better with less effort. To lighten the heavy cognitive load as the brain attempts to make sense of signals, Oticon hearing aids are equipped with Speech Guard E, Spatial Sound, FreeFocus, and YouMatic features. Oticon hearing aids treat degrees of hearing loss that vary from mild to profound, and they also offer pediatric hearing solutions. Oticon hearing aids are available in behind-the-ear, receiver-in the-ear, mini receiver-in-the-ear, invisible-in-canal, completely-in-canal, and in-the-ear styles. Models include Alta, Nera, and Ria, which are all fully customizable to the wearer. Tinnitus treatment is also available in the form of natural sound therapy. Oticon now offers a FittingLINK wireless programming device that gives audiologists an accurate and convenient way to personalize Oticon hearing aids for their patients.